When I reviewed the excellent Tamiya Honda City Turbo, I did splash out on a few hop-ups for the car. 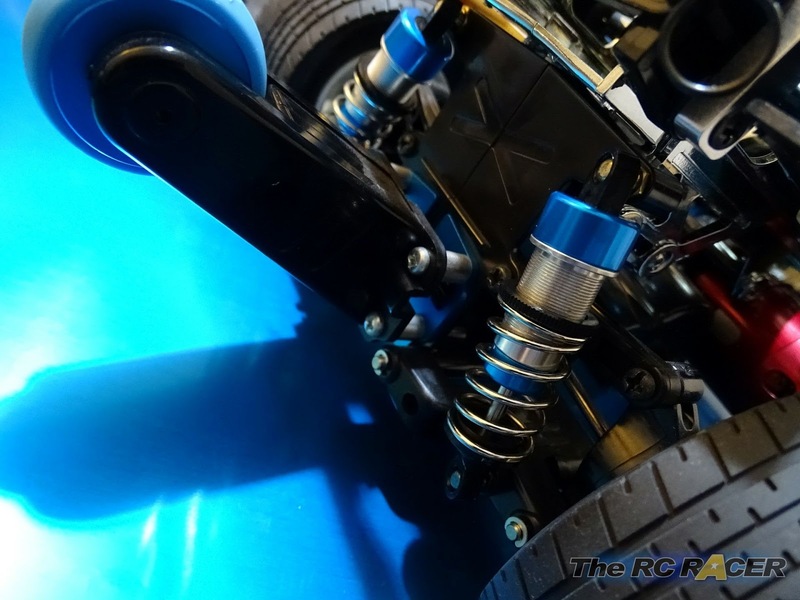 At the time I mounted some excellent TRF shocks, but despite the car handling well I was keen to get a set of shocks that would allow me to fit a range of different springs including the longer stock springs. 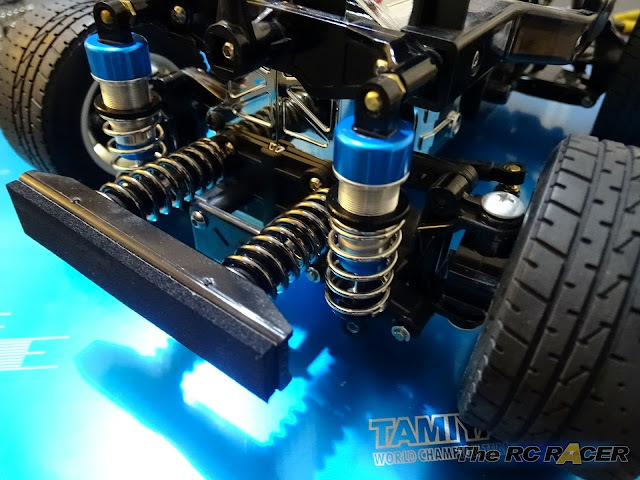 When browsing the web I noticed that there were some new shocks available for the GF-01 and WR-02 chassis. Importantly they looked to be well priced, threaded and strong. Once they arrived I delved in to take a closer look. The first thing I noticed is that the shocks themselves are not recommended for the WR02-C I cannot see why they would not fit so I set about building them to see if I could get them to work. 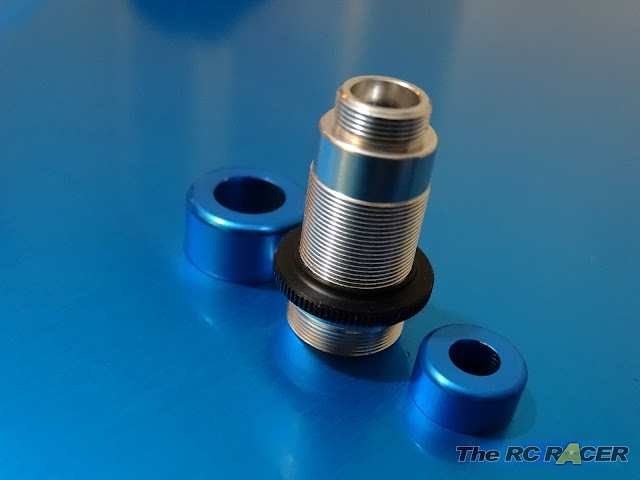 As you can see above, the shocks have a silver aluminium threaded cylinder and blue anodised caps and lower cylinder attachments. 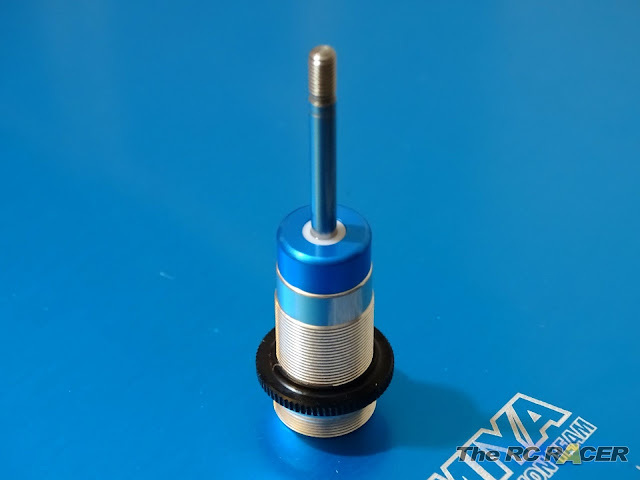 The spring adjuster is made from plastic and it moves freely up and down. 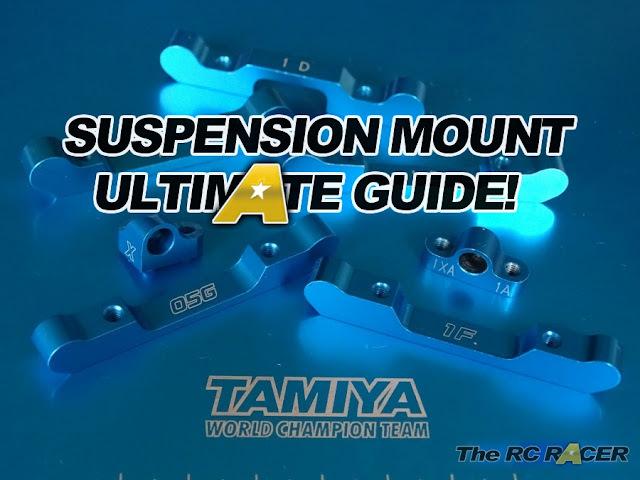 The first thing to do is to build up the shock pistons. 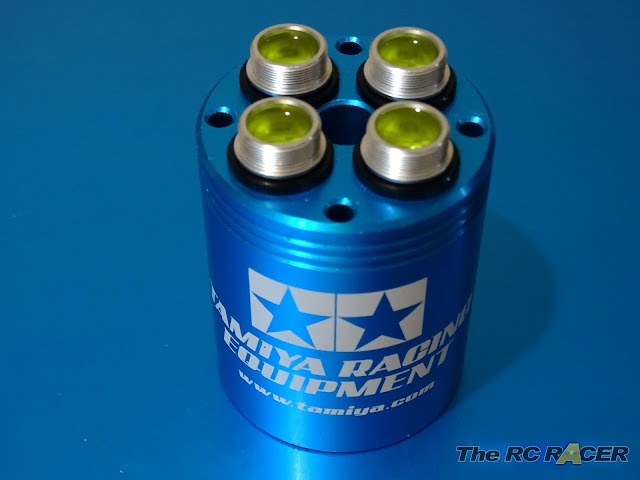 The pistons themselves have 3 holes and are well machined TRF parts. No trimming required and assuring you that they will move smoothly inside the cylinder. The piston is attached with two E-Clips. These are easy to attach but you do get a few spares included in-case one of the suckers decides to fly off across the room. 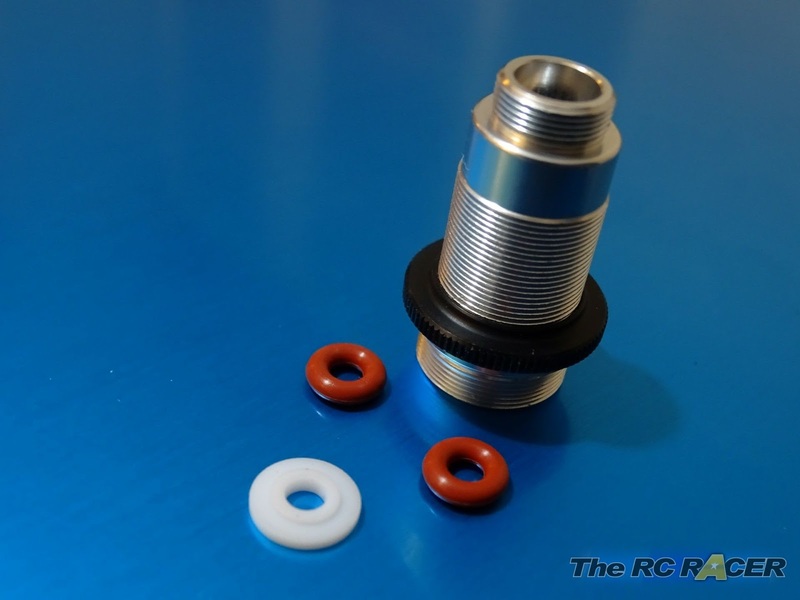 With the two o-rings inserted and the rod guide placed on top, you just need to screw on the lower cylinder cap. Once attached it all feels very secure. I slid the shaft in and the lubricated rings allowed it to go in smoothly. 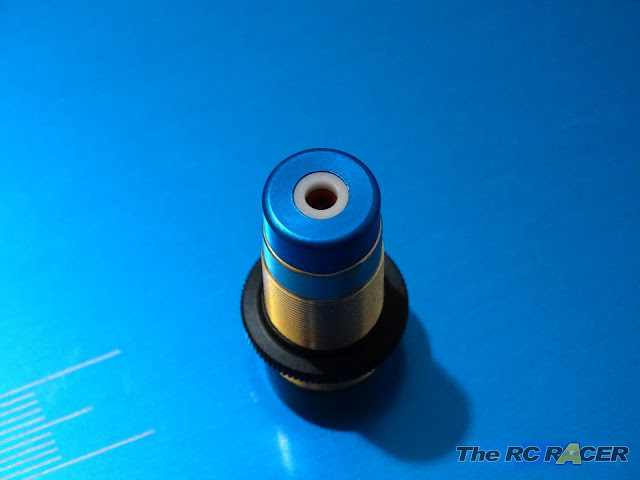 I deviated now and tool a look at the shock against the WR02-C. The length looked fine, I was a little bemused why it is not recommended. I did however think that the full length of the shock was too long for how I wanted the car to handle. 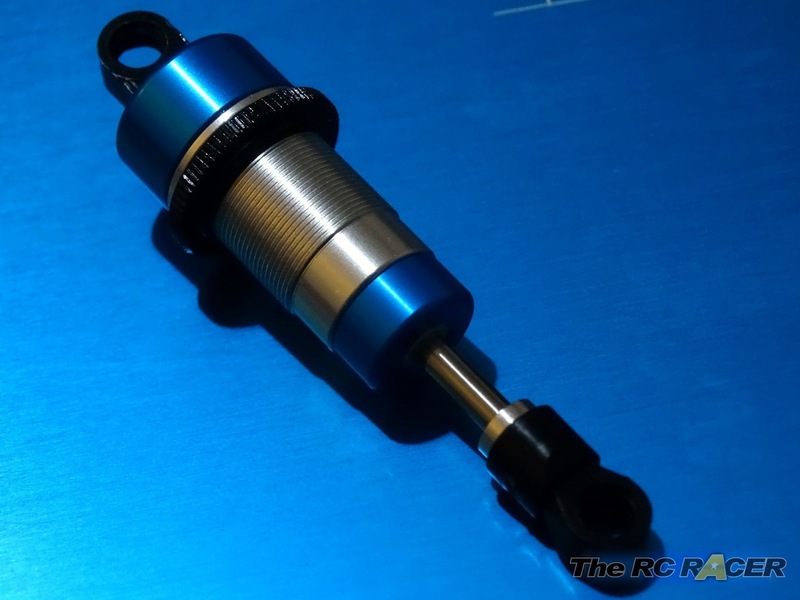 I just fitted 5mm of shims to shaft and then re-inserted it into the cylinder. If you do not have these around you can just go for rubber tube or something similar. The resulting length looked about right. Now we just need to add the lower V5 parts. 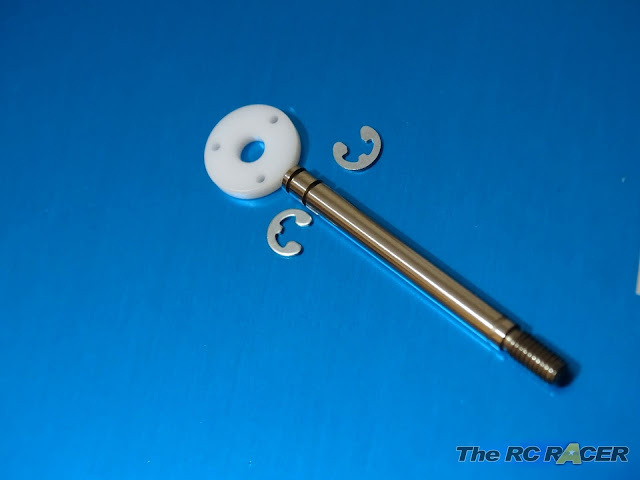 As you can see you can add shims or 0-Rings to raise the lower spring retainer. The manual shows recommended settings for this. 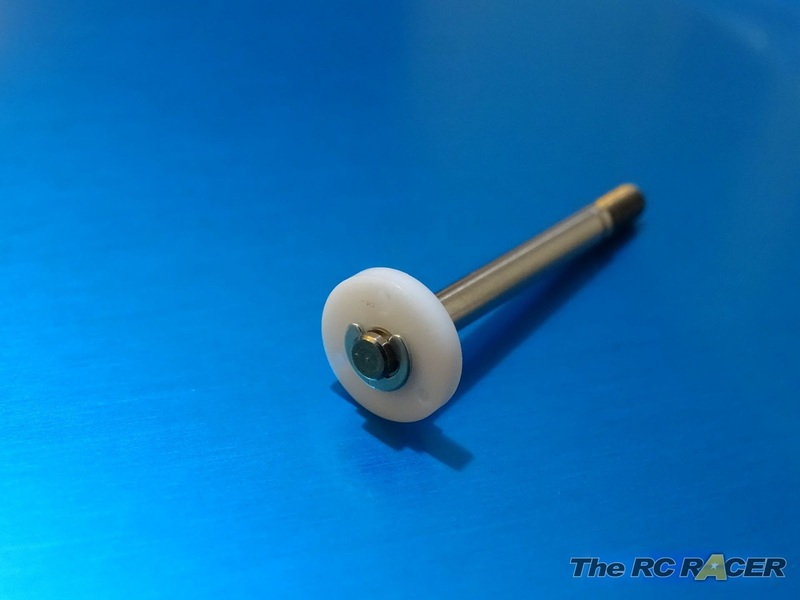 For the WR-02C I just used the 1.5mm shim as I wanted to use shorter Tamiya Silver springs these give the Honda City just the right amount of lean to help enter the corner, but are not too soft that it would roll over. The springs were attached and the whole movement of the shock felt really smooth. From a casual squeeze they feel very similar to the TRF ones that I removed. 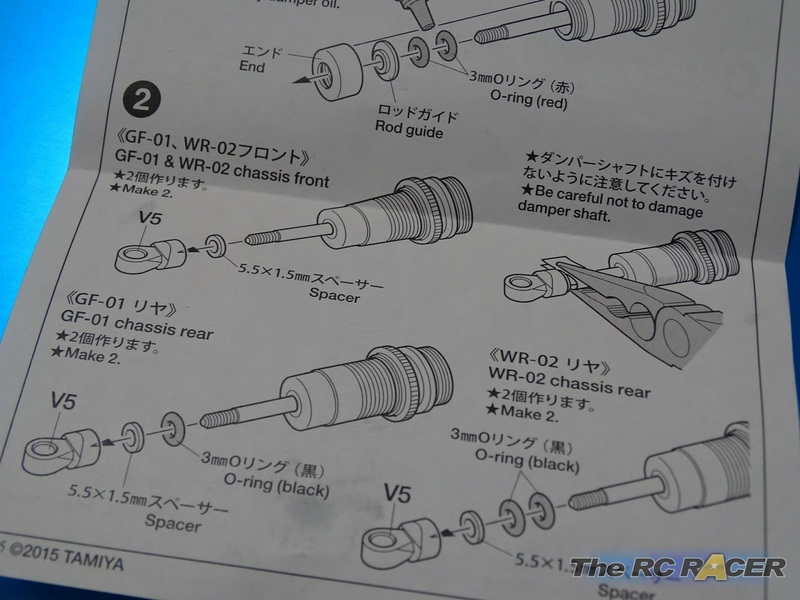 The shocks do not come with any springs, however they have all of the necessary mounting hardware to fit them onto the GF01 / WWR02 cars. Here they are mounted onto the front of the car. Here is the rear of the car, check out the blue wheelie wheel. 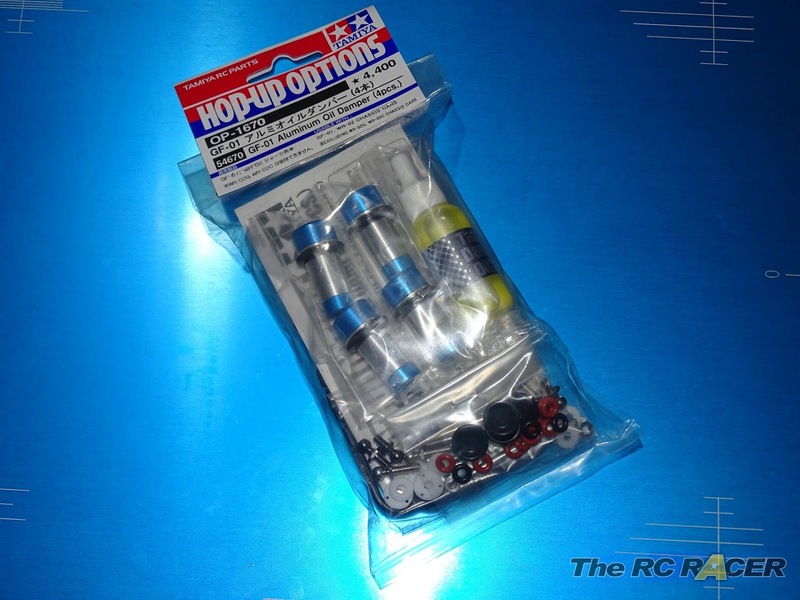 The only negative is that there are no springs included, but they are aimed at replacing the kit included shocks, so the kit springs will just fit straight on. 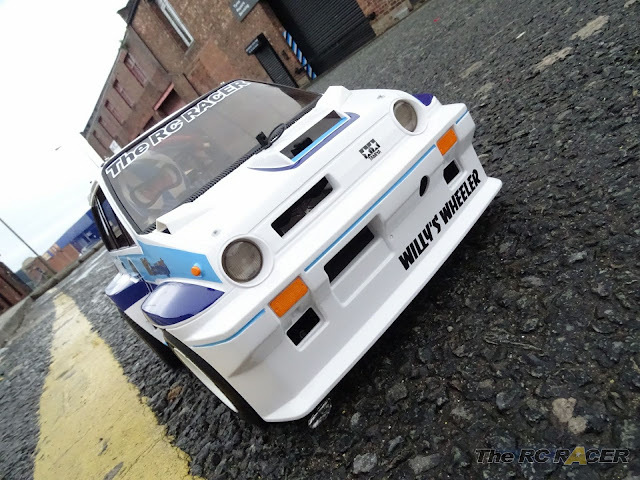 I am actually hoping to race against a heat of these soon at my local club so there are a few more modifications that I want to do to the car. 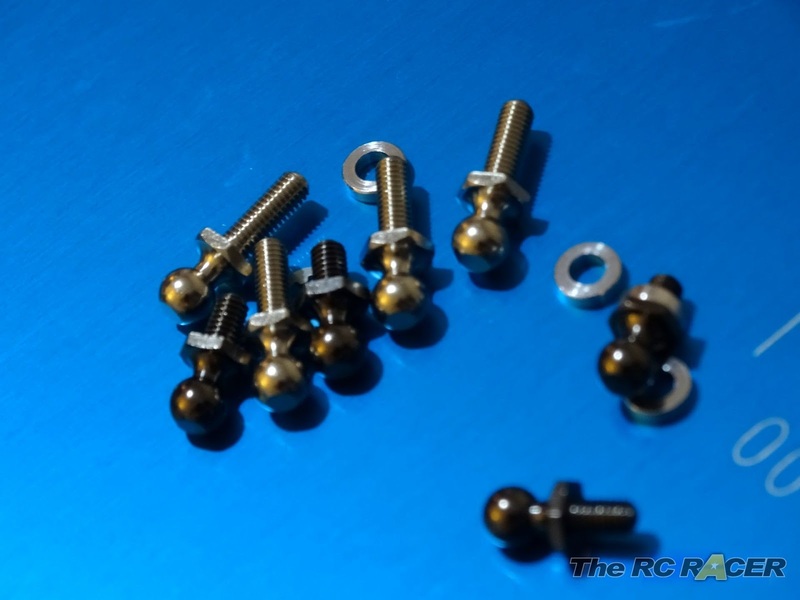 However in the meantime these shocks have been great, smooth, leak free and also providing a cheaper way to add some quality blue bling onto your Tamiya WR02 /C GF01 chassis. Sorry for the delay. They are approximately 75mm from top to bottom without the shims. Eye to eye, or Total lenght? 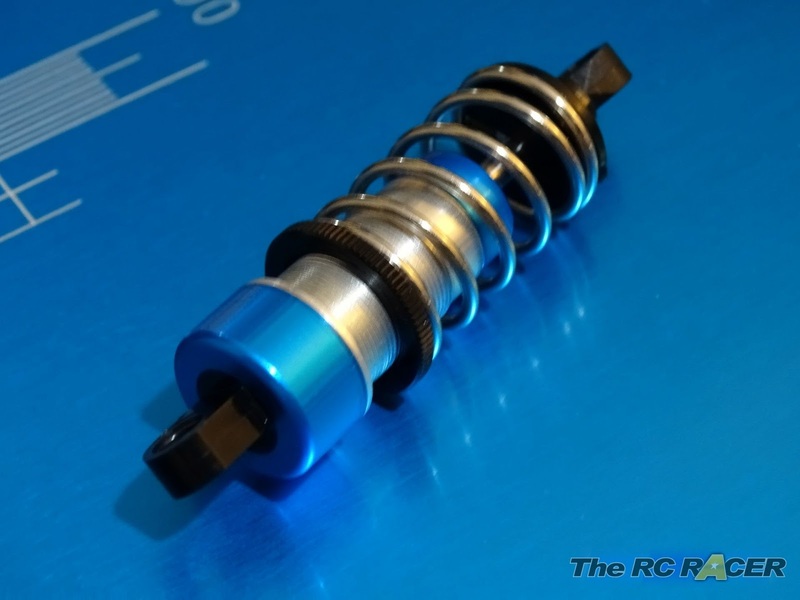 Are these TRF shocks the same (albeit in a different color) as the CC-01 set? They do look similar. But I do not have the cc01 versions to compare.